Symphony’s cloud-based instant messaging platform integrates with FactSet to enhance your conversations with real-time data. When you need to connect quickly with traders, research analysts, or coworkers and share charts, notes, or links, FactSet’s integration with Symphony’s open, cross-platform instant messaging system removes collaboration roadblocks so you can easily share information and knowledge between systems—and people. 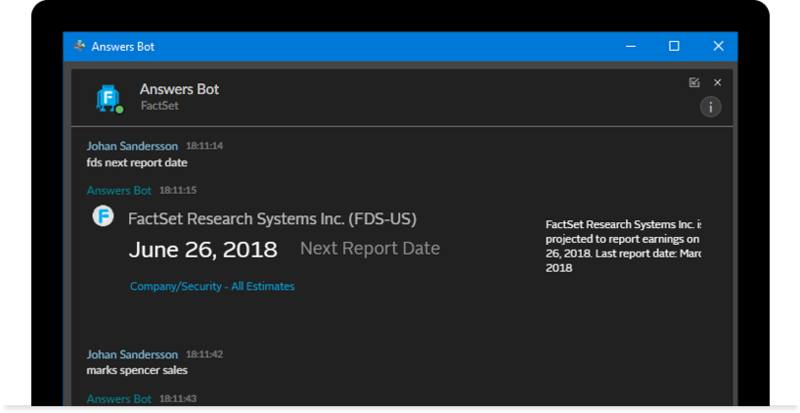 Connect with others with the context of FactSet. Your collaboration platform and market data and analytics solution should promote free-flowing ideas, not disrupt them by forcing you to switch from one system to another. Symphony seamlessly integrates with FactSet’s market data, research, trading, and analytics tools, enhancing your conversations with real-time data in context without interruption. Find information faster with intelligent tools. 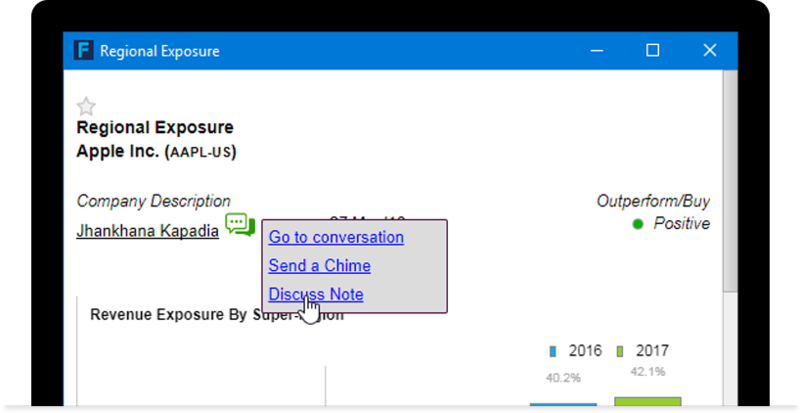 Bots, or “automated users,” help you find key information and use cognitive computing to respond with messages and data directly into your collaboration window. Links to FactSet applications take you directly to the source for further analysis into the data. 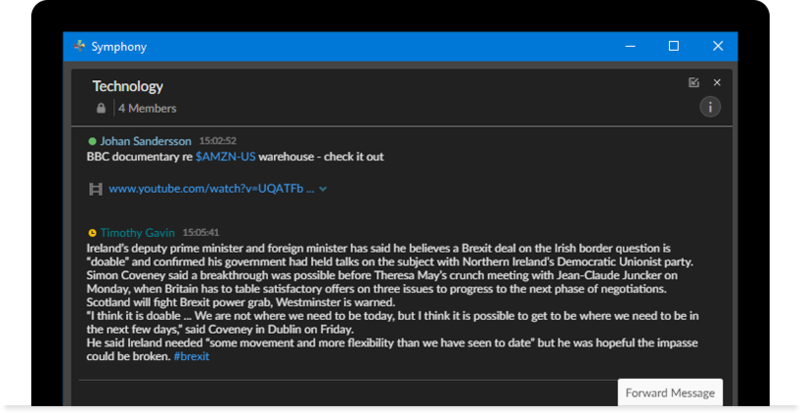 Filter messages, news, and data. Tags and structured objects help to organize your communications so you can easily pull relevant documents for ideas, M&A deals, or other initiatives, even as you’re walking into a meeting. Tags also provide quick launching points from Symphony to relevant reports in FactSet applications. When news breaks, StreetAccount sends you news alerts via message so you have the most up-to-date information in the office or on the road. Share information and maintain compliance. Secure connections let you network with a vetted global directory of over 300,000 users, broadening your community. 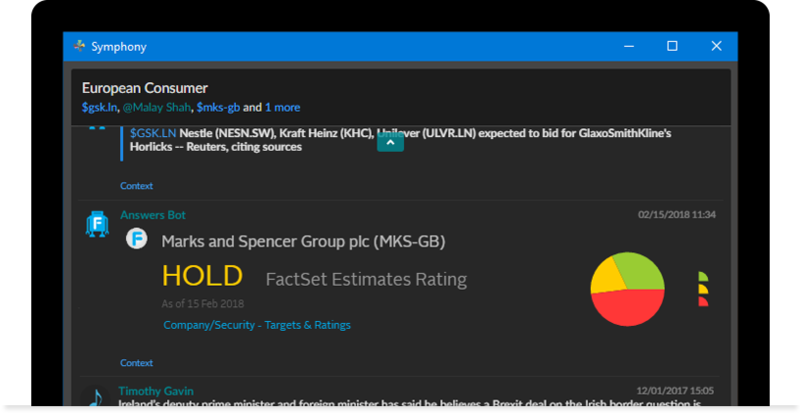 Create your internal research notes and contact research authors as you read their reports within FactSet, or share charts and notes with any Symphony user, inside or outside of your firm. To ensure compliance, Symphony integrates with various standard third-party archival platforms. Use Symphony’s compliance rules to restrict internal users from chatting externally or with specific people, and archived messages may be provided to a regulatory or legal agency when needed.